One of the stylized facts from the past 30 years has been the declining rate of first births before age 30 for all women and the increase rate of first births after age 30 among women with four-year college degrees (Steven P. Martin, Demography, 37(4), 523–533, 2000). What are some of the factors behind women’s decision to postpone their childbearing? 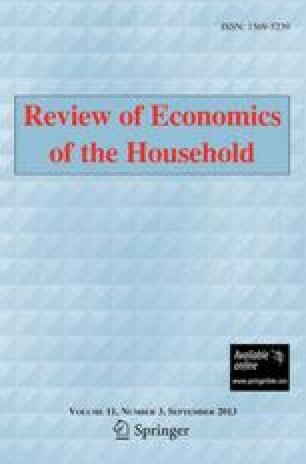 We hypothesize that the wage difference often observed between like-educated mothers and non-mothers (Jane Waldfogel, Journal of Labor Economics, 16, 505–545, 1998a; Journal of Economic Perspectives 12(1) 137–156, 1998b) may be affected by the postponement of childbearing until after careers are fully established. Hence, we focus on college-educated women because they are typically more career-oriented than their non-college educated counterparts and also the group most often observed postponing maternity. We use individual-level data on women from the 1979 National Longitudinal Survey of Youth (NLSY79) in order to control for individual-level unobserved heterogeneity as well as human capital characteristics, such as actual work experience, in our empirical analysis. We estimate wage equations, first producing base-line results to compare to the existing literature. Then, we expand the basic wage equation model to address fundamental econometric issues and the education/fertility issue at hand. Our empirical findings are two-fold. First, we find that college-educated mothers do not experience a motherhood wage penalty at all. In fact, they enjoy a wage boost when compared to college-educated childless women. Second, fertility delay enhances this wage boost even further. Our results provide an explanation for the observed postponement of maternity for educated women. We argue that the wage boost experienced by college-educated mothers may be the result of their search for family–friendly work environments, which, in turn, yields job matches with more female-friendly firms offering greater opportunities for advancement.